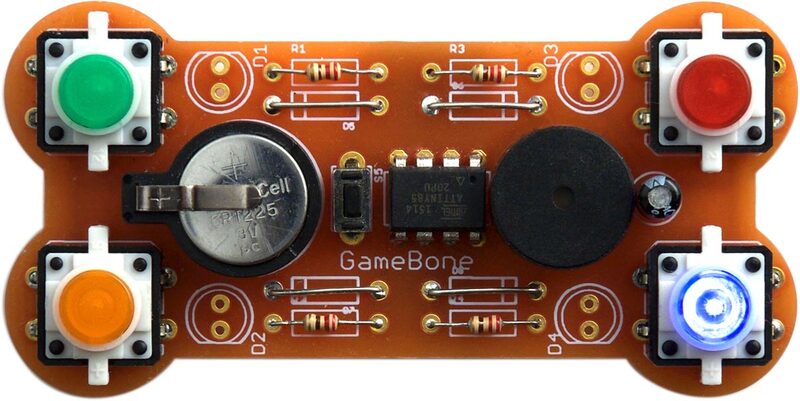 The ATtiny85-based GameBone handheld electronic game plays four different games. It is based on an ATtiny85, and consists of four illuminated pushbuttons (or plain pushbuttons and LEDs), a reset button, a piezo buzzer, a battery, and four resistors. It plays a choice of four games, including Simon. If you're not already familiar with it, Simon plays a sequence of tones and lights, and you have to press the correct buttons to reproduce the sequence. At each round the sequence increases in length, and the aim is to reproduce the longest possible sequence without making a mistake. The GameBone also includes three other games: Echo, Quiz, and Confusion, and these are described below. There have been several earlier designs for Simon games, including Sparkfun's kit , but I think I'm safe in saying that this is the simplest, with the fewest components. You could build it for about $10/£10, excluding the PCB. Circuit of the GameBone handheld electronic game. As well as saving I/O lines, this circuit automatically lights up the corresponding LED when you press a button. To read the status of a pushbutton program the I/O line as an input, and to light a LED program the line as an output and leave it low. Note that you shouldn't program a pin as an output and take it high. For the buttons I used illuminated coloured pushbuttons with integral LEDs, available from Sparkfun , or from HobbyTronics in the UK , but I designed the circuit board so you could alternatively use plain 12mm square pushbuttons and coloured LEDs. There's also a reset button, which is a mini PCB bushbutton switch from Pololu . The speaker is a small 12mm piezo buzzer, and the whole circuit is powered from a 3V CR1225 (or CR927) lithium button cell, mounted in a 12mm holder . The final version of the PCB board design for the GameBone handheld electronic game. I developed an initial version of the Simon game in uLisp, my Lisp interpreter for the Arduino, running on an ATmega328; see Simon game. The C version described below is an extended version of this. A note number, from 0 to 11, representing the note in the well-tempered scale, where 0 represents C, 1 represents C#, and so on up to 11 for B. The octave, which can be from 1 to 7. Invalid octaves will have the same effect. E3 (button 3, green, upper left). The check() routine then tests each input to see which button caused the interrupt, and returns it. During sleep the current consumption is less than 1µA, giving an expected battery life of a few years. This is the classic Simon game; the GameBone plays a sequence of tones and lights, and you have to press the correct buttons to reproduce the sequence. At each round the sequence increases in length, and the aim is to reproduce the longest possible sequence without making a mistake. This is a two-player variant of Simon. The first player presses one button. The next player repeats that button and then adds another button. This continues, each player reproducing the sequence so far, and then adding another button to the end of the sequence before passing the GameBone to the other player. The first player to get the sequence wrong loses. Unlike Simon, the Echo game allows you to press the same button two or more times in a row. This uses the GameBone for quiz games of up to 4 players. Each player has a button; the questionmaster reads a question out, and as soon as one player thinks they know the answer they press their button. Their tone sounds, and the light stays on for three seconds to confirm who got in first. The lights are then cleared ready for the next round. This game is like Simon for the first two rounds, but then it starts flashing the wrong light for all but the last note in the sequence. You have to copy the sequence of tones without being distracted by the false lights. I compiled the program using Spence Konde's ATTiny Core, which supersedes the various earlier ATtiny cores . Select the ATtinyx5 series option under the ATtiny Universal heading on the Boards menu. Then choose Timer 1 Clock: CPU, B.O.D. Disabled, ATtiny85, 1 MHz (internal) from the subsequent menus. This is the default fuse setting on new ATtiny85s; otherwise choose Burn Bootloader to set the fuses appropriately. To upload the program I used Sparkfun's Tiny AVR Programmer Board; see ATtiny-Based Beginner's Kit. To connect the programmer board to the ATtiny85 on the GameBone I temporarily soldered two 4-way header sockets to the ATtiny85 pins on the bottom of the circuit board. Here's the whole GameBone program: GameBone Program. Alternatively, get it on GitHub here together with the Eagle files for the PCB: GameBone on GitHub. ^ SparkFun Simon Says - Through-Hole Soldering Kit on SparkFun. ^ LED Tactile Button - Red on SparkFun. ^ LED Tactile Button - Red on HobbyTronics. ^ Mini PCB Pushbutton Switch on HobbyTronics. ^ Keystone PCB Mount Battery Holder for 12mm Coin Cell on RS Online. ^ Ragworm PC prototyping service. ^ Othermill Pro on Other Machine Co.